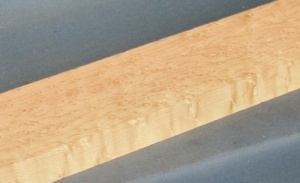 Birdseye maple guitar neck blank type A strong figure. For spliced head and slipper heel construction. Bird’s eye maple has been well regarded by guitar makers for hundreds of years and it produces a fine sounding guitar of singular beauty. It is also a departure from the ‘everything must be quarter sawn’ school of guitar making because bird’s eye figure only displays properly on slab cut faces.